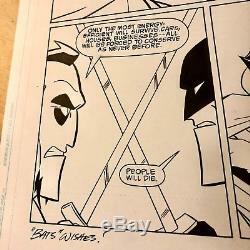 This is "Gotham Adventures" #23, page 19 by Tim Levins with inks by Terry Beatty, who is the one signing it in the bottom corner with Bats Wishes. Scott Peterson wrote the issue, and the lettering is done on the boards by hand by Tim Harkins. The page is still very white. Some of the pictures make it look yellower, but that's just a trick of the lighting in this room. There's a small ding in the bottom right corner. You can see it in the closeup picture. It's small and doesn't go anywhere near the art. 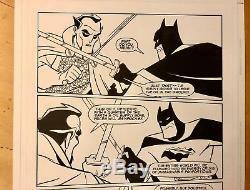 Besides being from one of the great Batman runs, it's a page with Batman and R'as Al Ghul sword fighting. 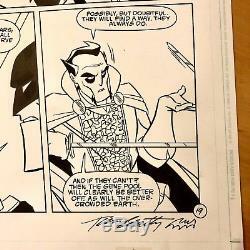 What more could you ask for in a page of original art? 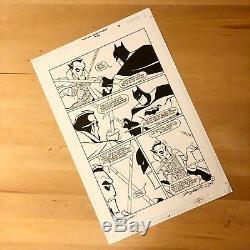 The item "Batman, R'as Al Ghul Tim Levins Batman Gotham Adentures original art" is in sale since Friday, January 12, 2018. 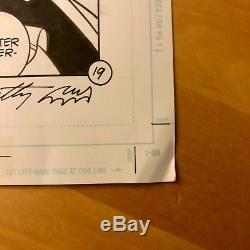 This item is in the category "Collectibles\Comics\Original Comic Art\Interior Pages". The seller is "augiedb" and is located in Wayne, New Jersey. This item can be shipped to United States.